Before we get all crazy, it is Sal that is no longer at Apple. The technologies remain. Let’s hope it stays that way. Sal is a great guy. I’ve met him and chatted with him numerous times. He’s been evangelizing AppleScript since the System 7 days when he caught the AppleScript fever through his desktop publishing work with Quark. He always paid thoughtful attention to me and my site. He once told me he would make a point of showing my site to Apple engineers as an example of the power and public popularity of AppleScript. Meanwhile, I am optimistic about the future of desktop automation on the Mac. I guess I have to be. “Other Apple applications.” Like iTunes. When Apple Music was announced back in June I didn’t think I’d care for it. But during the 3-month free trial, I found myself using it a few times a week. It’s good for a quick playlist in the “For You” section and I’m often delighted by some of the stuff suggested. And, despite never really taking to Spotify, I like being able to play those, “I Just Thought of Something!” albums and artists at the drop of a hat. I use it from the Music app on my phone and from iTunes on a couple of Macs in the house. Now, I’m not giving up my exquisitely maintained iTunes audio file library by any means. But Apple Music is fun and convenient so I’m staying on as a subscriber. But then I found out that the audio files of all those Apple Music tracks I’d been cavalierly listening to are were being downloaded and stored in my Mac’s Home folder. As a result, my hard disk had about 3 gigabytes of protected mystery files that I wasn’t sure were deserving of quarter. I mean, like…What songs are those? 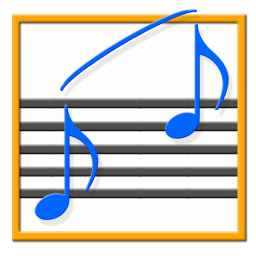 View Cached Music is an app (not a script) that will list track information about any extant cached audio files giving you a modestly-detailed history of the music you’ve been listening to in Apple Music on your Mac. 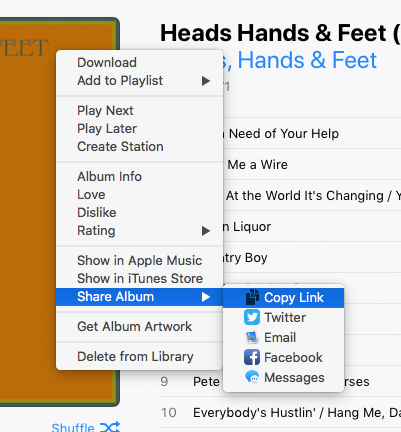 It also provides a means to play audio previews (as in the screenshot above), open the Album and Artist pages of these tracks in Apple Music, copy-to-clipboard their artwork, and delete any cached audio files you may consider superfluous. 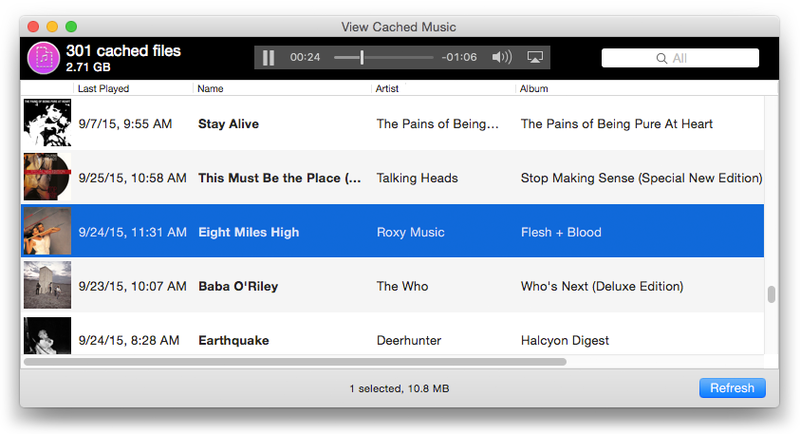 View Cached Music is free, requires OS X 10.9 or later and Apple Music activated. More information and download is on this page. And if you don’t care about the trove of music history buried in the cache folder, there is always Flush Apple Music Cache Files. The first wave of Apple Music trials will be expiring soon and if you haven’t subscribed for real it means saying so long to any Apple Music added to your iTunes library. I’m not sure if these files will disappear when the trial ends for you. iTunes doesn’t appear to remove them even now, so if you’ve used Apple Music a lot then this folder will be loaded with quite a number of full-sized audio files. I’m a sucker for some of those “For You” playlists and I’ve managed to get my own cache folder up to about 7GB. And if you’re subscribing to Apple Music and are tight on drive space, you can flush all you want anytime. Apple Music will re-download any music it requires again later. The playlist also has a loved property. track also has album loved. UPDATE: Unfortunately, current track and current playlist are broken for Apple Music tracks. So changing the loved property of a playing Apple Music track can’t be done. Today, Apple released a new version of iTunes for OS X that accommodates its new MUSIC service, comprising: Beats 1 global 24/7 radio; algorithm- and human-curated playlist streams (replacing iTunes Radio); “Connect”, the social media component; and the ability to play tracks streamed from Apple’s music catalog alongside your current library tracks. Apple did not make the new iTunes app available to developers before its official release and, of course, the Apple Music services weren’t available until today either. So I had to wait like everybody else to see what AppleScript changes may have been wrought upon the latest iTunes app. I’m primarily concerned with still being able to manage my own media library with AppleScript and, if possible, accommodating any streaming Apple Music tracks that I may mix in with them. There are changes in iTunes 12.2 that will require several if not many scripts and apps to be updated. This is going to take me some time to ascertain, but I will report the issues when I have figured them out.